If you are a stylist, chances are you have already heard of the latest Italian dryer by Babyliss, the ItaliaBrava. I could not wait to get my hands on it to try it out after seeing it at this years show! We were lucky enough to get a sample last week and we have been loving it ever since! Below, I’ve listed a little more detail about the dryer and exactly why we love it so much. 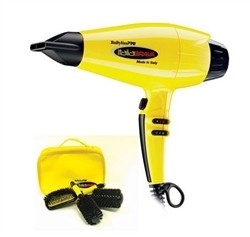 Description: The Babyliss Pro ItaliaBrava Hair Dryer features a fierce Ferrari yellow color with a similar engine. It has a Ferrari-designed engine with MaxLife Pro brushless technology allowing for quicker and quieter drying. This dryer is made in Italy and also features nano titanium heat technology. The dryer is 2000 watts, has 6 heat/speed settings, cold shot button, 2 snap-in concentrator nozzles and a lock-in turbo boost. BONUS: The ItaliaBrava dryer also comes with a Ferrari yellow pouch that contains 2 round brushes and a paddle hair brush that are of such an amazing quality it’s hard to believe they come free! Feel & Style: The most amazing feature about this dryer has got to be the weight. There are ton’s of lightweight dryers on the market but in most lightweight dryers the first thing you lose while losing the weight is power. That is not at all the case with the ItaliaBrava. My second favorite feature is the recessed filter on the back of the dryer. It 100% prevents hair from getting sucked into the fan of the dryer. Usage: I tried out all of the different heat settings on this dryer as well as the turbo boost before I chose which setting I would use on my fine, processed hair. Because of how powerful the dryer is, I found I was able to do the same blow dry on medium heat with turbo boost that I would have to use high heat for with any other dryer. That made me incredibly happy because we all know, less heat = less damage! I also played with the turbo feature on clients in the salon and noticed that it significantly reduced my overall drying time throughout my 4 hour day. All in all, I would say it all added up to about 30-45 minutes saved! Love that! After all, time is money in the salon, right? Results: I used this dryer both on myself at home and in the salon and it is hands down my new favorite dryer… EVER. It’s worth every cent! This dryer is an absolute must have for any stylist, especially as blow-out bars become increasingly popular! My hair dryers just as soft and shiny as it always does in easily half the time! Who wouldn’t love that? I hope you all try & love this dryer as much as I do!